We are the remarkable entity, engaged in offering a superior range of Electronic Drum Sets to our valued clients at very affordable rates within committed period of time. 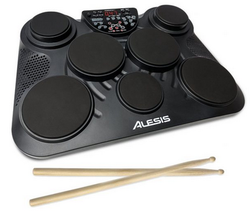 This pinnacle of electronic drumming technology is fully equipped with DTX-PAD drum pads, next-generation electronic drum pads that Yamaha has designed specifically for drummers. A versatile yet compact kit that contains the RS130, an electronic drum rack born from Yamaha's extensive drum manufacturing experience.